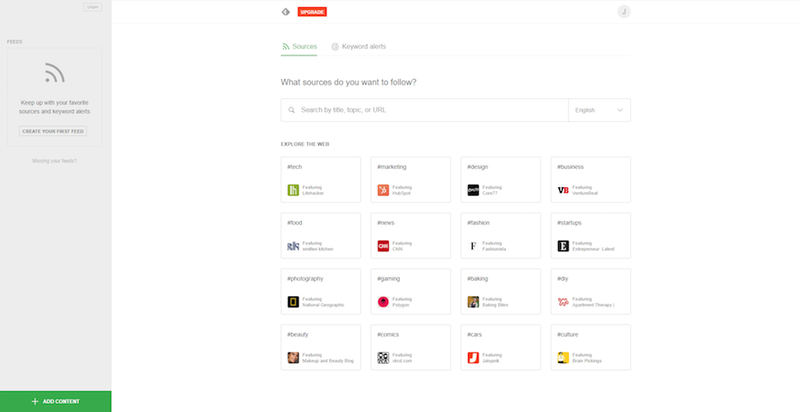 Feedly is a free service (with advanced premium features available) that gives you the power to conveniently organize and streamline information. This information (i.e. content) is sourced from the rss feeds of blogs or other online resources. While most commonly used as a free, well designed, and easy way to keep up with a user’s favorite blogs, Feedly also lends itself to more serious and professional use cases too. Including targeted on-going research projects, individual and group content curation, social sharing, and even content creation that relies heavily on citing/quoting sources around the web. In this article, we’ll show you how to set up a free feedly account and take advantage of its features for streamlined content consumption, curation, and sharing. The account creation is the familiar, no hassle, email activation process you use for every other type of account. You can also connect your Feedly account with Facebook and Twitter with a single click. After completing the signup process, you’ll be presented with your account’s primary interface. It may seem a little bare for now, but we’ll change that. From this page, you will be able to immediately get started by searching for the feeds you want. But first, let’s explore what’s available to you here. Today: Allowing you to view articles from all of the that days’ followed feeds. Filter (available to Pro users): Allowing you to negate keywords. This is more of an extra work around, as you can get rather specific in your article searches with the basic accounts functionality. Feeds: You won’t have any when you first start an account. However, this is where you will see the content you are following, organized into folders. Boards: This will allow you to post articles in many ways not just from your Feeds, but from other methods like a Feedly browser extension, or even a URL. Don’t forget the Feedly app. Giving you cross-platform sharing. The last items in the left panel contain the self-explanatory Recently Read and Support, which is a means to access their rather affordable premium services, and customer support. The last two options are Share Collections and Integrations. Both of these features require premium services. Both are powerful tools beyond the scope of this article and are certainly worth it. As someone who uses premium, the integration option streamlines a part of my freelance workload and pricing starts at around $5 a month. Last but not least, access your account at the top right, next to the quick search box. This includes general setting, browser appearance, and billing information. The primary function of Feedly is to aggregate information. This process involves using algorithms to collect article data across the web. This essentially gives you the ability to search vast amounts of written content, without the hassle of searching through scores of irrelevant information. You can use the search function to find the topics that relate to your needs. You will get a return of various feeds from blogs and websites related to the keywords you input. When you see a feed you want, click the Follow tab next to it. You will be given the option to create a folder for the feed or you can place it in an existing folder. AND: This allows you to search for multiple keywords in an article. For instance, searching for an industry with many facets, like technology, will result in a slew of potentially unrelated material for what you need. By adding other terms associated with the specific needs of your workflow like “Technology AND Pharmaceuticals,” you’ll get feeds that better match your interests. OR: If you are looking for a selection of varying articles, the OR function allows you to request articles from feeds relating to different topics. The board itself can be used in many ways. For instance, you can use boards to create simple newsletters for employees and clients, use them to organize briefings or share them through a variety of formats. This allows a one-stop spot for all the data you or your team has collected. 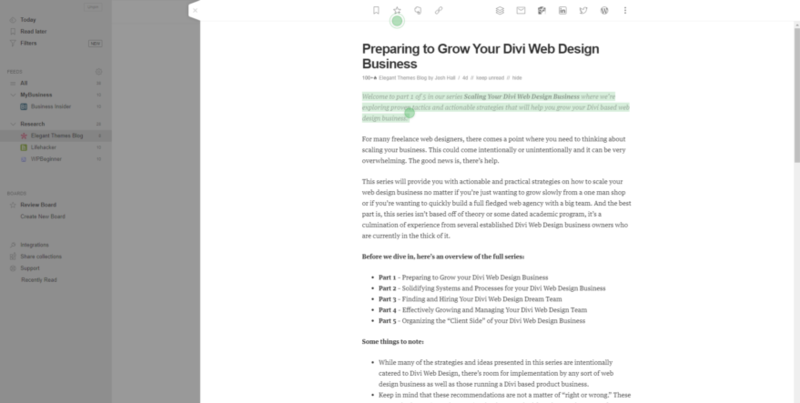 Keep up-to-date with those in your industry by using the Evernote integration, too. This option is available in the toolbar, which appears while viewing an article on a board. You can also work with parts of an article. This is great for when just a snippet of an article is relevant to your needs. Simply highlight what you want to share, like a paragraph of text. Left-click to reveal several options, like making a note or sharing on Facebook. Now that you are familiar with the workings of Feedly, allow me to offer an example of how it can increase productivity for freelancers, designers, and developers. So, let’s say you are an entrepreneur. You specialize in the Java programming language. One of the essential things you would need to accomplish as a freelancer would be to keep track of current trends. You should also monitor any information you can use to grow your client base and project size. You’d like want to monitor things like common debugging errors, customer interfacing issues, training opportunities, and more. With this information, you could keep tabs on the issues potential clients will face. This is the sort of information that can keep you abreast of the current needs in the field, while also allowing larger access to the industry as a whole. But how do you do this with Feedly? To further expand your connections, boards will be essential. You can build a team board to better approach larger projects. Or, you can create an individual board for tracking all the content you want to share in one place. This could include things like your blog, affiliate partnerships, advertisements, industry publications, and so forth. All in all, Feedly strives to make content sharing and the organization of that content less labor intensive, and accessible through a variety of sharing formats. By now you have a couple of feeds. Maybe you even have a few specific articles you want to share. And perhaps you want them organized so your colleagues can keep up-to-date with the information you want them to know. By saving one of your articles to a Board, the people you share it with can see any articles you’ve marked for urgency. They will also be able to quickly find the important information they need to see thanks to the highlight feature. Now that you have your bearings, it’s important to note how to use Feedly to promote your brand. Whether you’re trying to achieve as much visibility as possible or you wish to focus on a specific demographic, you can accomplish your goals here. While viewing articles on your boards, you are given several sharing features on a toolbar that appears at the top of a selected article. You can share to Facebook or Twitter, to the previously mentioned Evernote, or even to two of the most popular apps for scheduling social sharing: Hootsuite and Buffer. You have full control over the ways you share content with Feedly. This makes curating articles for your social following a snap. For instance, on any given day, you can open Feedly, add several articles to your sharing queue on Buffer (adding custom messages as you go, of course), then call it a day. Manually finding and adding content to social platforms each day is time-consuming. It’s easy to get bogged down in it. But it doesn’t have to be that way. Add many curated articles in one go, a couple times per week. That way, social media curation is no longer a daunting task. This just scratches the surface of how I can use Feedly to follow feeds, curate content, and share it with my audience. Feedly increases productivity and lives up to its status as a leading news aggregation service. Its multi-platform and cloud-based functionality gives you greater access and quicker notifications. This helps to ensure the information you need is in your feed. Over to you: Have you used Feedly? How has it helped to streamline your content curation efforts? Brenda, thanks for calling attention to and explaining this service. Sounds very helpful, and I’ll be giving it a try. I have become an Accidental Curator. I am obsessive-compulsive about meticulously archiving what I find and now it is difficult to maintain my collections on multiple subjects. I have thousands of Bookmarks in hundreds of Folders. Am I reading correctly? Is Feedly an alternative to Bookmarking? Is there a Divi layout for web-based content curation? And the Photo Marketplace and Design Conference ones could absolutely be adapted for that kind of curation through WordPress. I’ll also add that to the ideas list. 🙂 Good call! There are some curation plugins out there that automate the process of scraping content from other sites via RSS and creating drafts or publishing directly to your WP blog. But they’re horrible in terms of the quality of content they end up generating. As far as I know, there’s still no way of getting around a heavy overlap in automated content sourcing (like w/ Feedly) and manual curation/content creation. If your goal is to create content that while heavily curatorial is still valuable and unique. If you just want to automatically repost stuff, that’s possible. I use a similar set up almost every day. I also created a zap that sends each article I add to specific boards to an airtable base along with and parses (using the mercury parser that is in beta with Zapier and the formatter) the info out of the article url. This enables our team to add our comentary to article, change the title, and anything else before sending the “new” article (our commentary on the original article along with an excerpt or the original article, the name of the writer and publication and a link to the original article to our WordPress blog as a new post. I then have a zap sending it to buffer to various social media channels. (I know you can add comments to articles in Feedly, but for some reason they never appeared visually correct and I was not able to capture this same level of info on the article.) It saves a considerable amount of time! Thanks for this tutorial. It seemed from my reading of it that I could use Feedly Basic (free version) to create the Keyword Alerts you mention. But that is not so. You must pay for the monthly plan to do that. For free from Feedly, you get: Up to 100 sources, Up to 3 feeds, Up to 3 boards, Mobile and desktop. So, unless you want to pay for this service, it doesn’t provide much. For free tools, I like G2 reader.